When a friend queried: "Cooking queen, do you have a favorite hummus recipe you could share?" How can I resist?!? As you wish, Jess. Here's a basic hummus recipe. For added flavor and flair, I've added pumpkin puree, edamame, and sundried tomatoes. Not at the same time. Those are three different variations, but feel free to experiment. I always do. *you can buy dried garbanzo beans, soak them overnight, and cook till soft. But at that rate, I'd just as soon buy hummus! Add a small amount (1-2 tablespoons) of olive oil in the well. Garnish with rough-chopped parsley (optional). I'm sure there are as many variations on cabbage slaw as there are cooks, but I think mine is pretty unique. 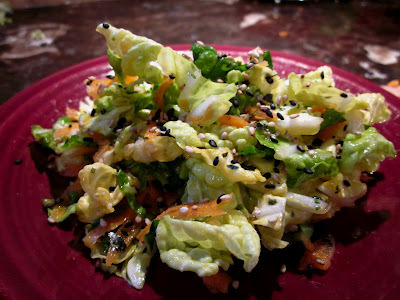 I add dried mulberries, dress it with a kumquat vinaigrette, and sprinkle it with Japanese furikake (toasted sesame seeds and shredded nori). Tart, sweet, crunchy. Delicious. Inspired by the two heads of Napa cabbage and loose carrots in my CSA box this week, I decided this would be the perfect side dish to my green garlic gazpacho. 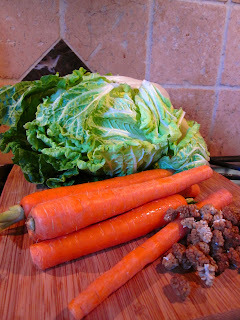 For the slaw: wash, dry, and thinly slice two heads of Napa cabbage. Shred six carrots. Add a handful of dried mulberries. 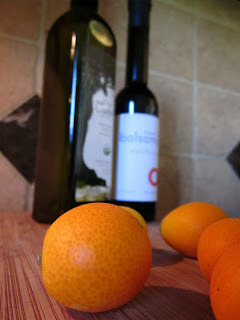 For the dressing: 1/4 C port balsamic vinegar, 1/2 C olive oil, 1/4 C ginger syrup, juice from 6 kumquats, fresh chopped basil. Emulsify then pour over slaw. Serve with a sprinkling of furikake. 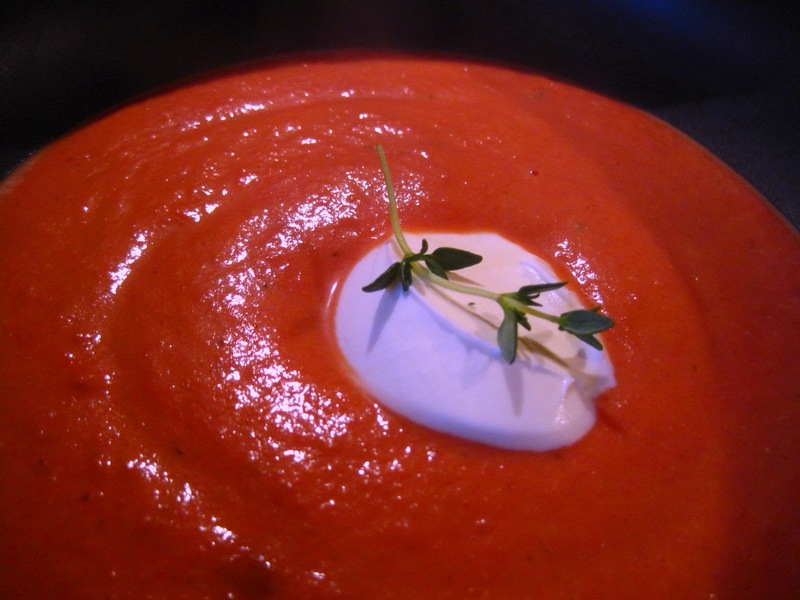 Gazpacho is a chilled tomato-based raw vegetable soup, originating in the Andalusia, the southern region of Spain. It is also consumed in neighboring Portugal where it is called gaspacho. I decided it was the perfect canvas to use the green garlic from my CSA box. 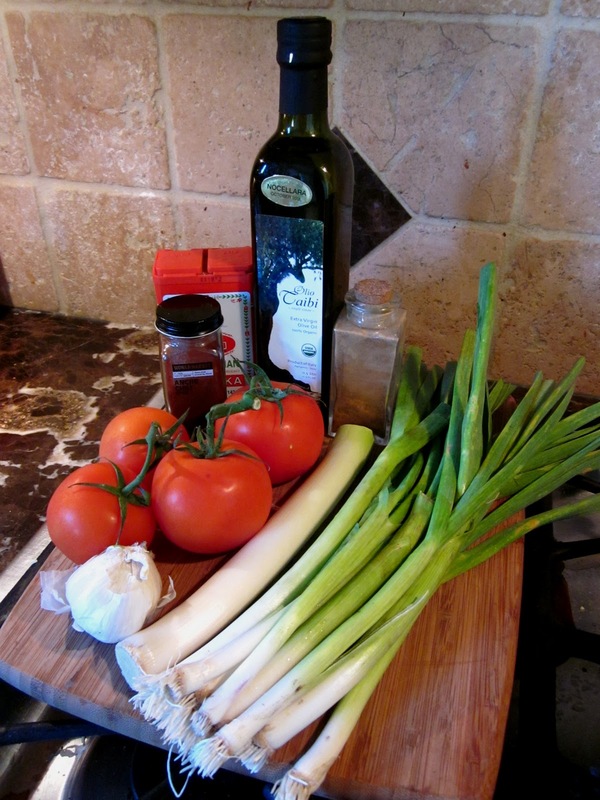 In a large sauce pan, sauté sliced green garlic, leeks, and minced garlic in a splash of olive oil. When they begin to soften and brown, add a splash of red wine and season with ground spices. 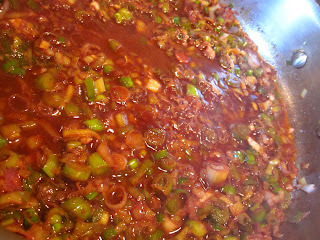 Simmer till completely softened. 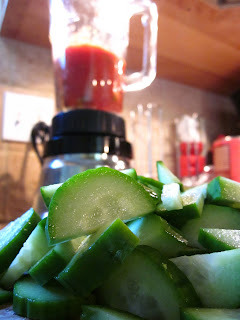 Then, in batches, blend the garlic mixture with chopped tomatoes and cucumbers. Let cool completely. 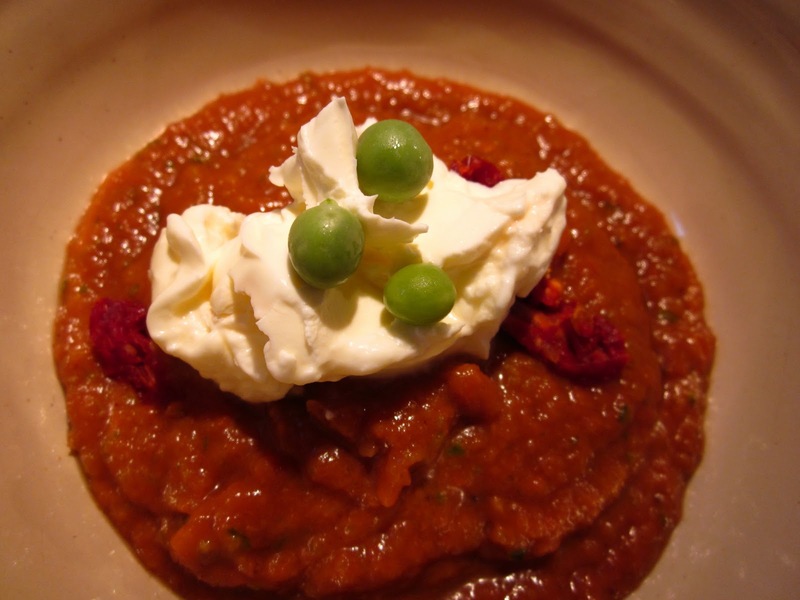 Serve with a few sliced sun-dried tomatoes, crème fraîche, and fresh peas. I've mentioned this before, but one of the things I love about my weekly CSA box: the variety keeps me on my culinary toes. 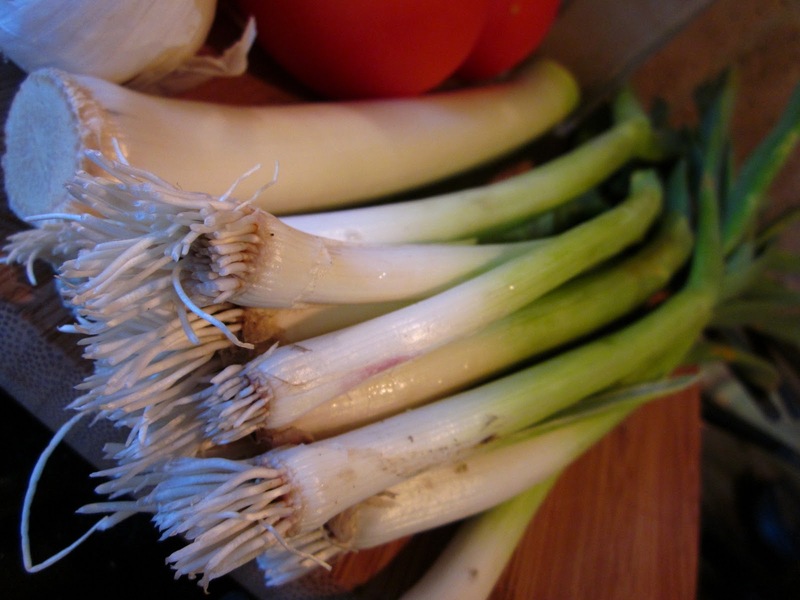 Before I started my subscription, I had never cooked with, much less heard of, green garlic. Green garlic is simply immature garlic and looks like a slightly overgrown scallion or green onion. Everything I read told me to trim off root ends and any tough part of the green leaves. 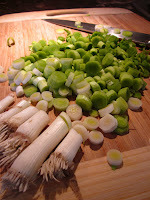 Then, chop or slice white, light green, and the first few inches of the dark green leaves (as long as they are tender). The weekly CSA newsletter from High Ground Organics suggested a green garlic soup, but the warm temperatures today had me craving something cool. So I decided to make a Green Garlic Gazpacho instead. If you've been following me for awhile, you know that I'm attracted to the odd and unusual. If I see something on a menu that I've never tried, I'll order it. When I travel, my eye automatically falls on the strangest shaped fruit at the fruit stand. "What is that?" is typcially followed quickly by "I'll take two. Thank you." 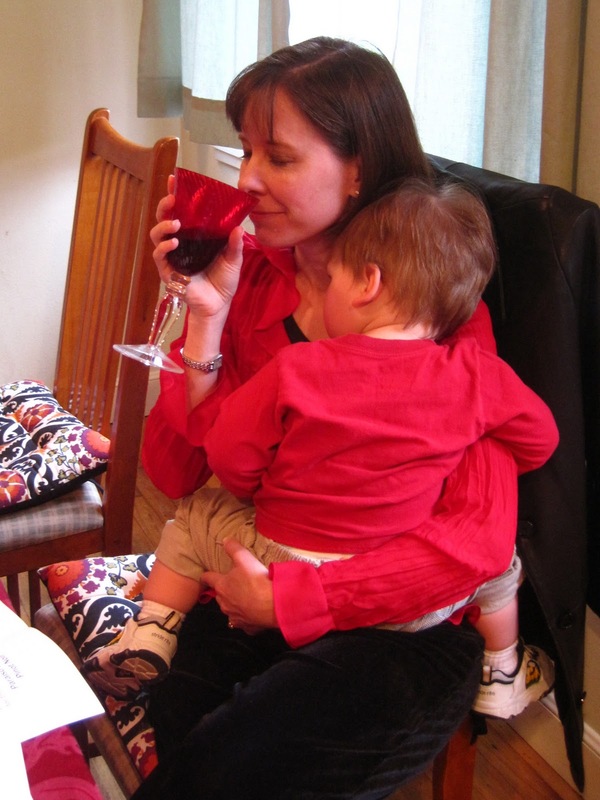 Apparently, that habit has rubbed off on my kids. When we were visiting the Hilmar Cheese Company, Riley danced up to me with a jar. The fruit inside was pouch-shaped, a dull orange, and suspended in liquid. Though I don't often buy fruit in a jar, I was intrigued. "Mom, look, I found a new kind of fruit. Have you ever tried this?" I peered at what he was holding: Chilean Carica. "No, I've never heard of that." "Can we try it, please?" "Of course." So, I happily forked over some cash and let him buy it. Later that evening, we opened the jar, drained off some of the liquid, and sliced it up. Chilean Carica (Caricacea Pubescens) is a rare fruit from a semi desert area in the North of Chile, called Limarí Valley. 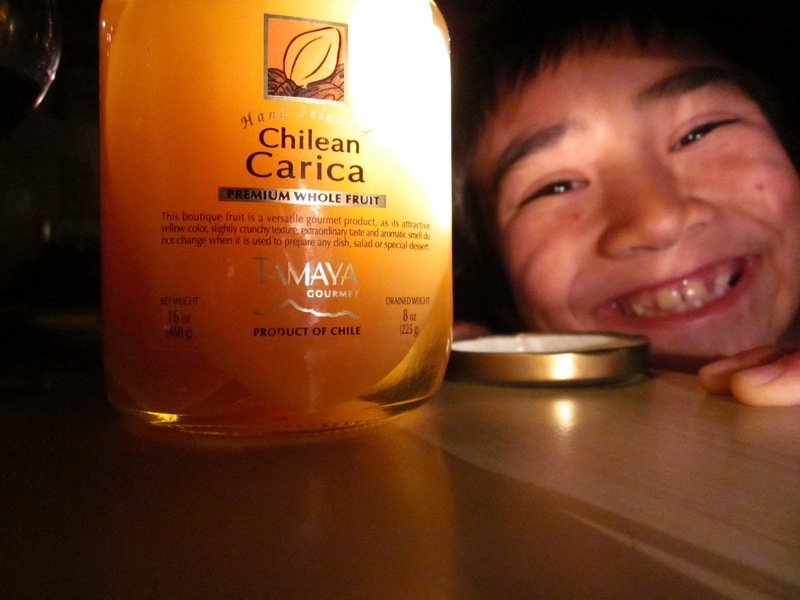 It is also known as the Chilean Papaya, Golden Papaya and Chilean Mountain Papaya. Reminiscent of jackfruit, but not as sticky. Mango-like? Now I just need to figure out where I can get some more. It was delightful. I can think of all sorts of ways to serve it. We've all recited the nursery rhyme about Miss Muffett. C'mon, you know it. But how many of us know what curds and whey actually are? 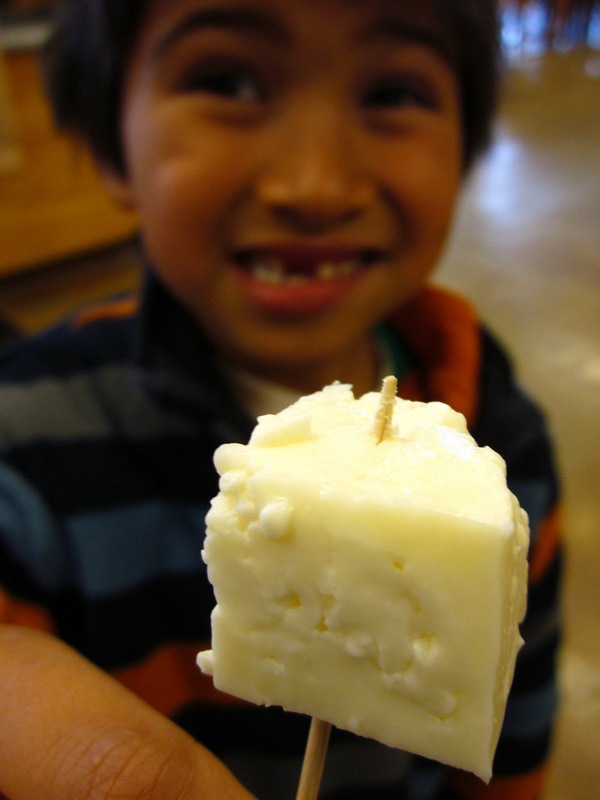 During the cheese-making process milk is separated into two parts: solid (curd) and liquid (whey). The whey is, often, recycled much like grey water. While the curds go on to become cheese. 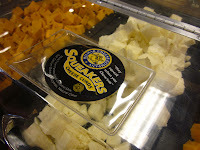 Or, at Hilmar, curds are marketed and sold. Hilmar Cheese Company called them 'Squeakers' and sold them by the pound. The kids loved them. I'm not sure that they tasted any different than any other cheese that we would buy; in fact, they are mild, virtually tasteless. But it's definitely the squeak-factor that grabbed the kids. And they really do squeak when you chew them! That, in itself, was worth the $8 for the tub of curds. When one of the girls we were with at the cabin started talking about snow candy from Little House in the Big Woods, I was tickled. I remembered that same passage from when I read those books many, many, many years ago and was thrilled to help her make some. Boil the molasses and sugar together in the large pot until the mixture reaches the "hard crack" stage on a candy thermometer, or until a spoonful dropped into cold water forms a hard ball and cracks. Remove the syrup from the heat. Scoop fresh, clean snow (or crushed ice) into the shallow pan. 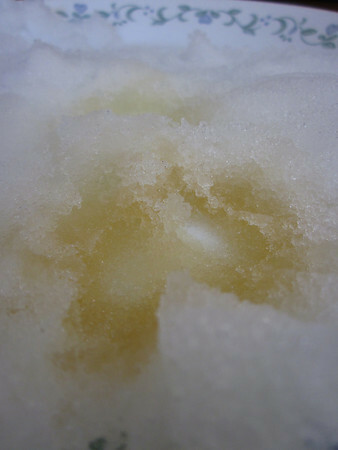 Dip up a spoonful of syrup and dribble it onto the snow in "circles, and curlicues, and squiggledy things" as Laura and Mary did. It will harden and become candy. 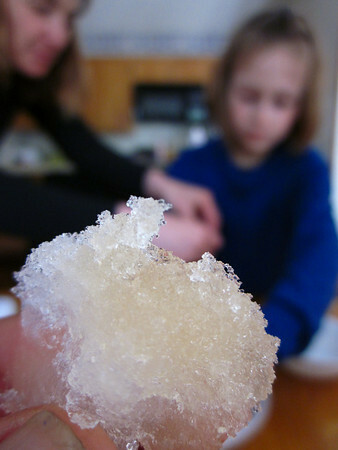 Lift the candy off the snow and onto a clean towel to dry. We just got back from a week in the snow. The moms and the kids went up at the beginning of the week; the dads joined us mid-week. What an adventure it was! When we arrived at the mountain resort we discovered that they had just evacuated the other guests and there was no power. There hadn't been power for three days. And we were strenuously urged to reconsider checking in. But stubborn, granola mammas that we are, we decided to load up on firewood, hang out till the power was restored, and call it 'ice camping' in the meantime. I mean, really, how tough could it be?!? We kept our perishables in buckets filled with snow. We subsisted on sandwiches, fruits, and nuts. 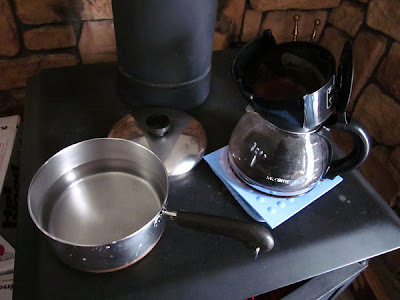 The only thing that had to be hot: morning coffee. It took some doing, but we did it. We robbed the coffee filter from their electric coffee maker, heated the water on top of the wood-burning stove, and poured the moderately hot water over espresso grounds. Success. And two happy moms. It's not a birthday party without a birthday cake, right? 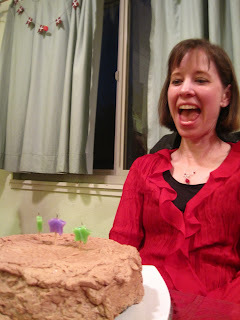 So, despite the fact that we had already indulged in beet mousse and affogato, I had to make a beet chocolate cake to hold the candle while we sang to Jenn. Preheat over to 350 degrees. 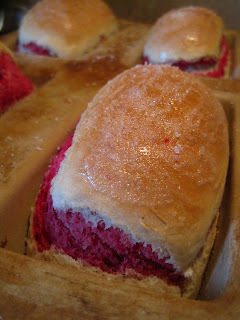 With a hand mixer, cream butter and sugar until lightened in color and fluffy. Add eggs one at a time, beating after each addition. Add cottage cheese and beet juice to the mix. 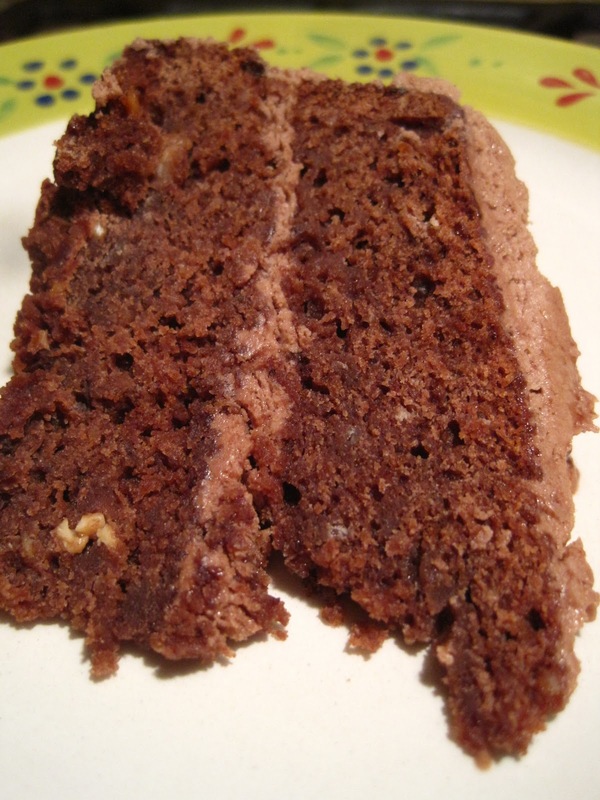 Using a spatula, gently stir in flour, cocoa, and baking powder. Stir in pomegranate balsamic vinegar. Batter should be somewhat thick. Pour batter into prepared cake pan and bake for approximately 40 minutes or until an inserted toothpick comes out clean. I frosted the cake with a cocoa buttercream ganache. Drowning in delicious decadence. Swimming in caffeine. Yum. Literally, that's what affogato means in Italian. Though, honestly, I don't remember ever seeing this concoction in Italy. But, then again, I don't have much of a sweet tooth, so I might never have noticed it. But when Jake ordered it at an ice cream shop in Berkeley last weekend, I noticed it and immediately wanted to replicate it. 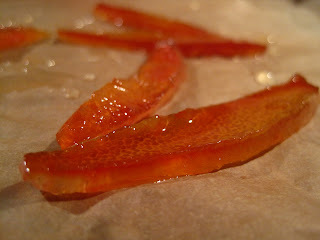 So, for the beet dinner party, I made beet juice-infused candied lemon peel to top my affogato. Espresso + vanilla ice cream + candied lemon peel. Che buono! Yes, you read that correctly. Beet. Mousse. 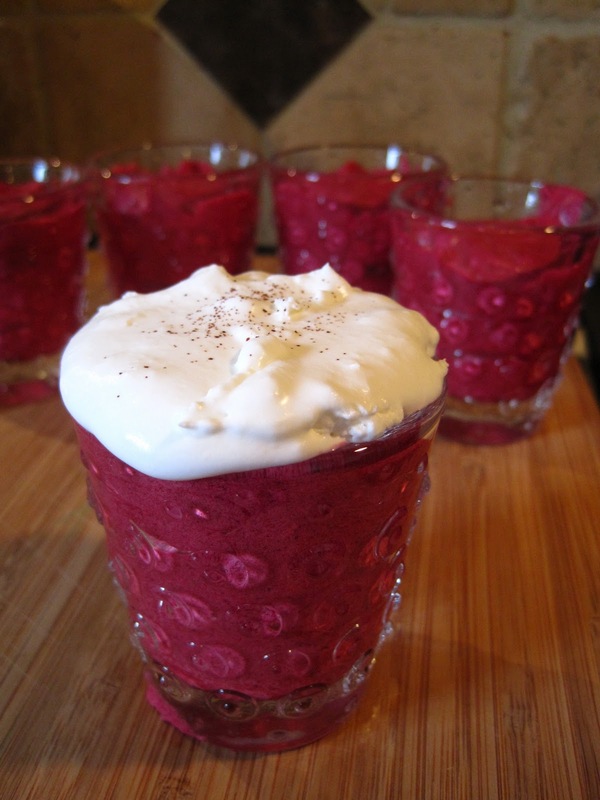 I came across a recipe for a beet-cardamom mousse and was instantly smitten. But I didn't have any cardamom, so I adapted and came up with this gorgeous colorful concoction. It was part one of my beet dessert trio. 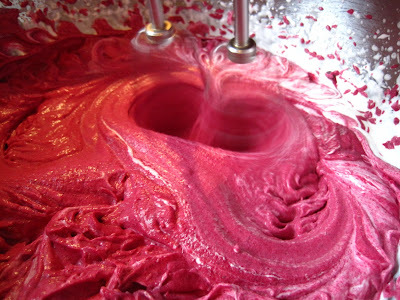 Transfer cooked beets to a blender. Take 1/2 cup of the cooking liquid and put in a small saucepan with the gelatin. Bring to a boil and whisk until well combined. This will take about 5 minutes. 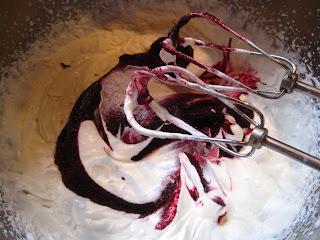 Transfer with the beets and blend together until creamy and smooth. Add the spices and syrup. Blend a little more. 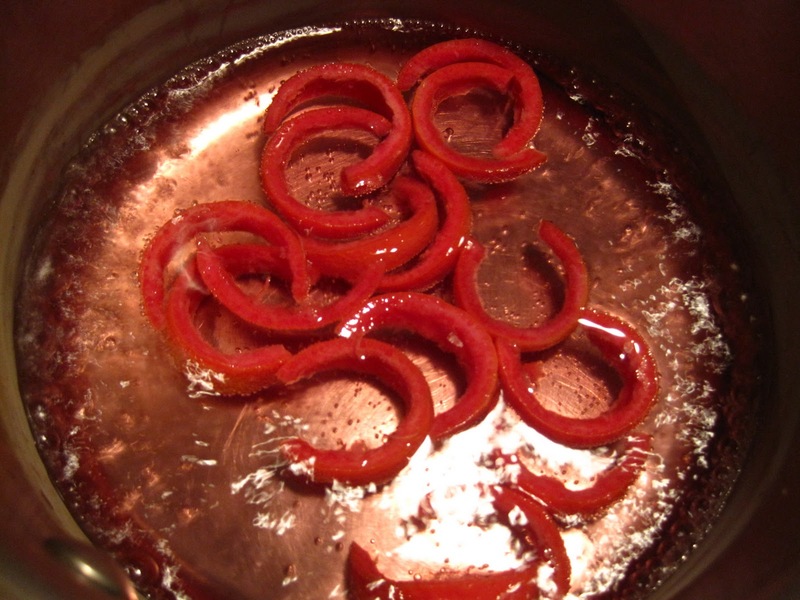 Transfer to a bowl and refrigerate until mixture has cooled completely ( about 1-2 hours). 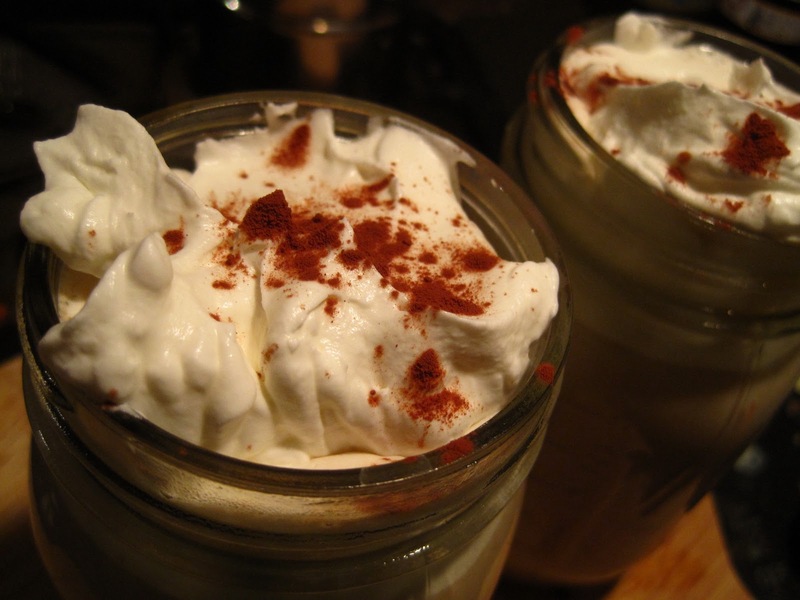 Whip heavy cream with 1/4 C organic sugar until strong peaks form. With a spatula, incorporate the beet mixture gently into the cream and refrigerate for 8 hours or more. Fill each cup with the mousse. 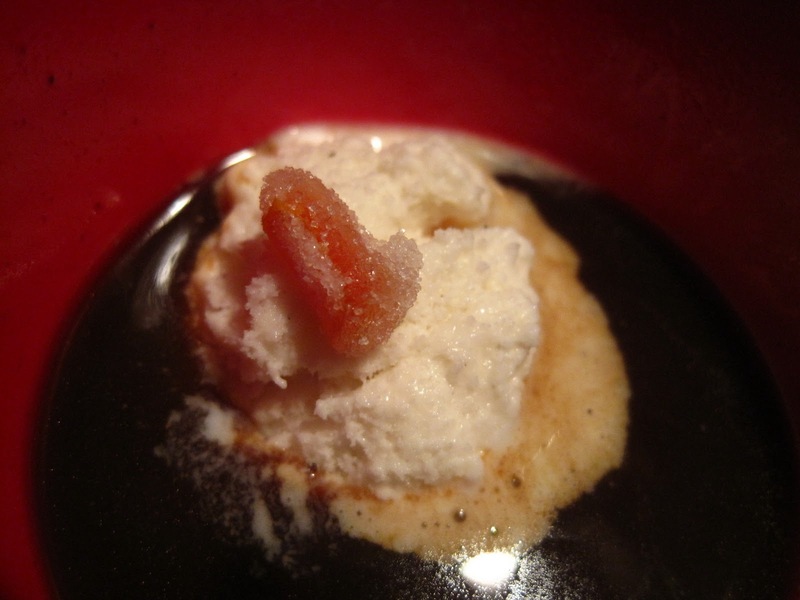 Before serving top each mousse cup with a dollop of whipped cream and a dash of ancho chili powder. I started with beet-infused syrups, added 1/2 C maple syrup, and used that as a base for some yummy bubbly cocktails. 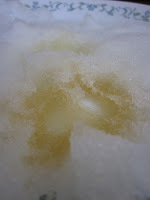 One thing that says celebration to me: Italian bubbles, in the form of prosecco. 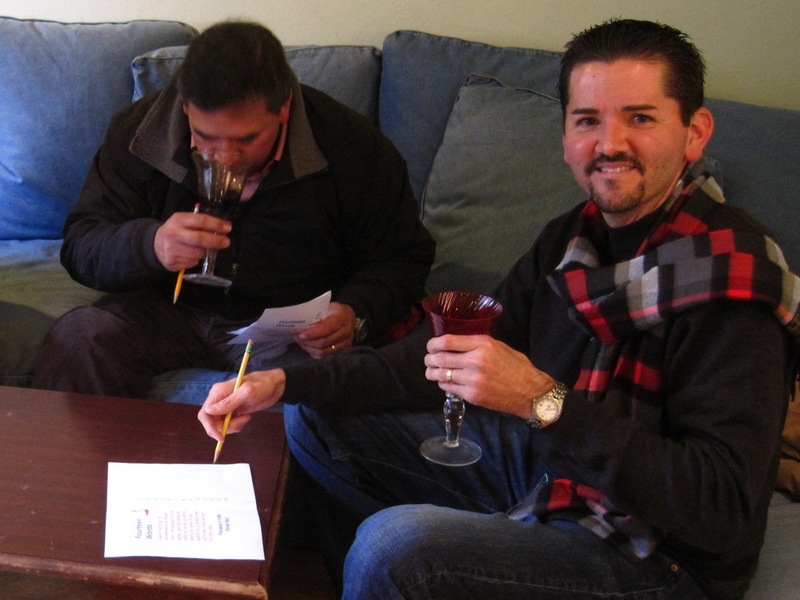 We added a tablespoon of syrup to a glass and topped it off with prosecco. The red beet syrup seemed sweeter while the golden beet syrup was definitely earthier. Both were delicious. Cin cin! I wanted to have Jake grill lamb lollipops to serve with my Spiced Beet-Apple Chutney, but the weather was not cooperating and my husband flat out said, "nope, I am not grilling in the rain." On to Plan B: a roasted leg of lamb, rubbed with a minced garlic-shredded beet-oregano-ancho chil powder mixture. I rubbed the leg of lamb with the mix above and let it marinate for four hours in the refrigerator. Then I let it come to room temperature while I heated the oven. Never having roasted a leg of lamb, I did some reading and decided to try the sear-slow roast method. So it went into the oven at 450 degrees for 30 minutes. Then I reduced the heat to 350 degrees and cooked it for an additional 15 minutes per pound. It was a four pound roast, so it was another hour or so. Then I pulled it out of the oven and let it rest before carving. 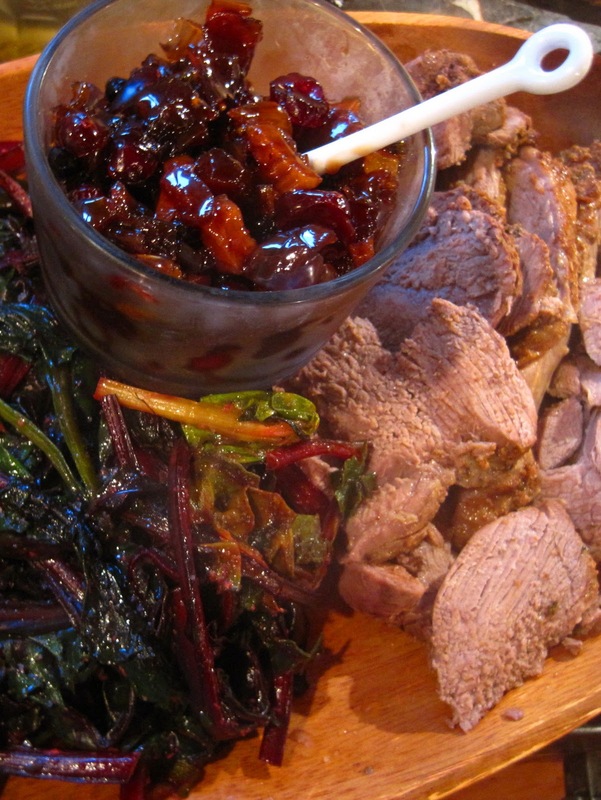 I served it sliced with sauteed beet greens and the chutney. To add a splash more color to my salad course, I topped the greens, watermelon radish, and pomegranate seeds with golden beets, caprese-style. 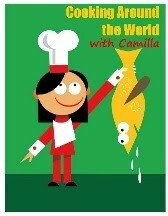 I write 'caprese-style' because caprese salad is fresh mozzarella, tomatoes, basil, and olive oil. So, technically, this wasn't a caprese. But it looked like a caprese. 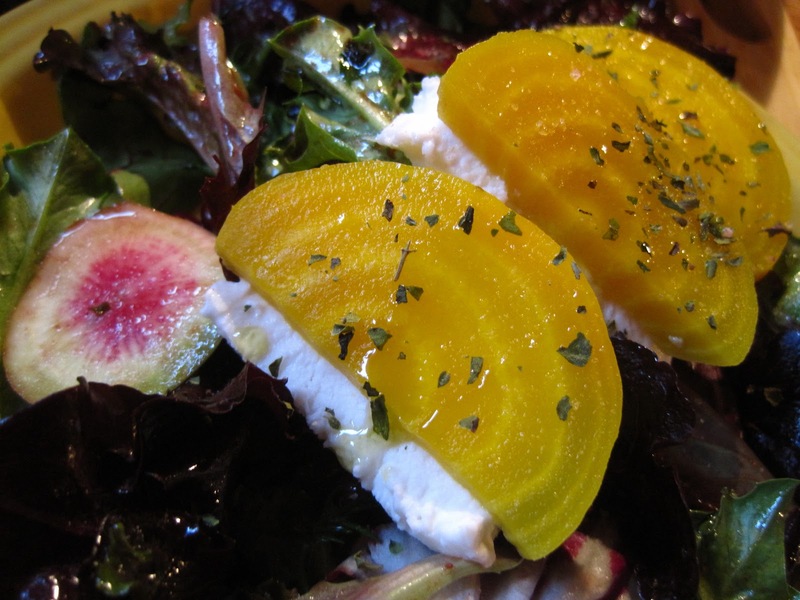 Sliced golden beets with slices of fresh buffalo mozzarella sprinkled with oregano and pink Himalaya salt and drizzled with olive oil. Love the colors...and the flavors. I started with a recipe from Bon Appetit and promptly made some adaptations, adding more root vegetables and using boullion instead of water. Preheat oven to 350°F. 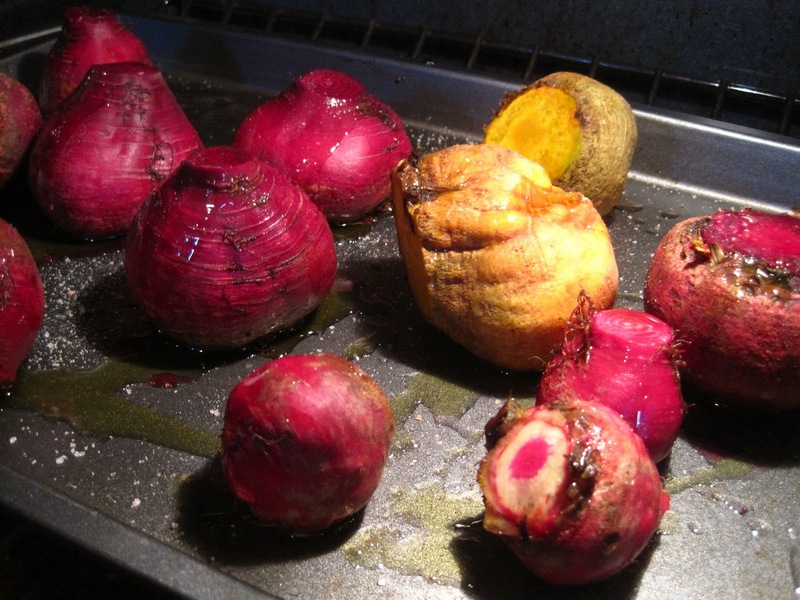 Roast beets until tender when pierced with fork, about 1 hour. Cool. Peel beets. Cut into cubes. Gently rewarm soup (do not boil). Divide between bowls. Garnish each with 1 tablespoon crème fraîche. Top with a sprig of thyme. 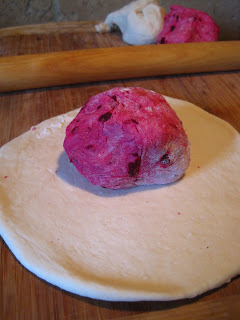 I had initially planned just to make beet rolls, but Jake suggested that I do a plain dough and a beet dough...and marble it. Okay. 1. 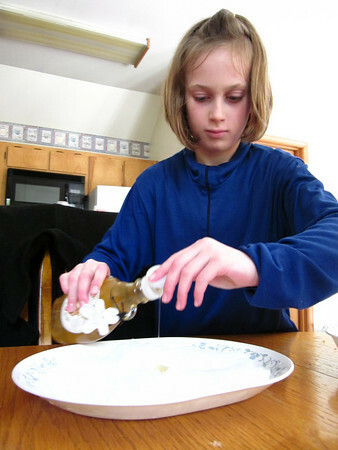 In a large mixing bowl, dissolve yeast and granulated sugar in warm water. Let stand until bloomed, about 5 minutes. 2. Add flour, honey, and salt. Form into a dough. If the mixture is dry, add one or two tablespoons of water. Knead the dough until smooth, about 7 to 8 minutes. 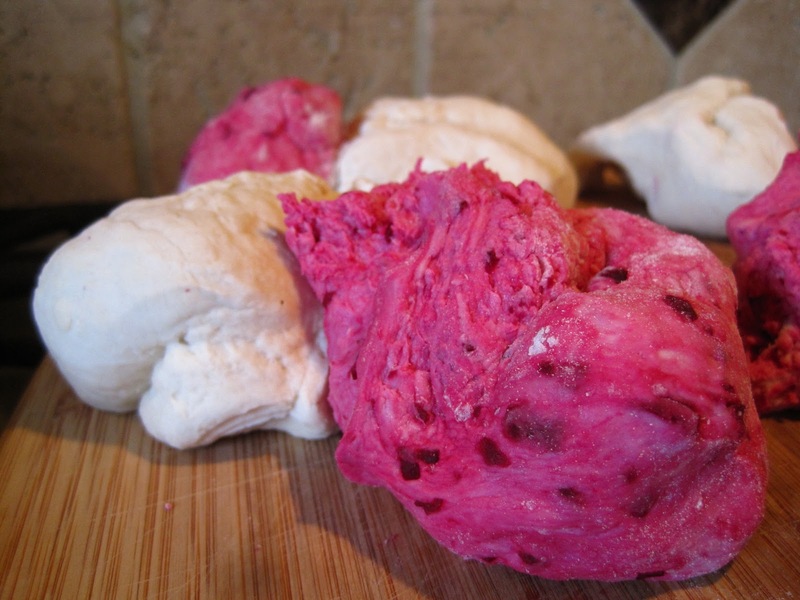 For the pink dough, knead in two shredded beets. 3. Roll out a disk of plain dough. Then roll our a disk of pink dough on top. Roll the dough into a loaf and place - to rise - in a mini loaf pan. Preheat oven to 350 degrees. Let loaves rise for at least 15 minutes. 4. Bake for 25 minutes until the tops are browned. Rub the tops with butter and remove from the oven. 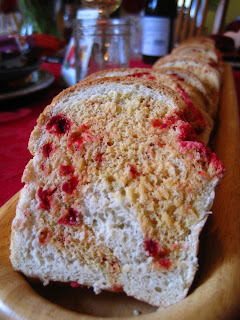 Oddly the loaf retained the bright magenta coloring on the outside of the loaf but when sliced, the marbling was so subtle it was almost undetectable. I was disappointed with the lack of color, but it was tasty. 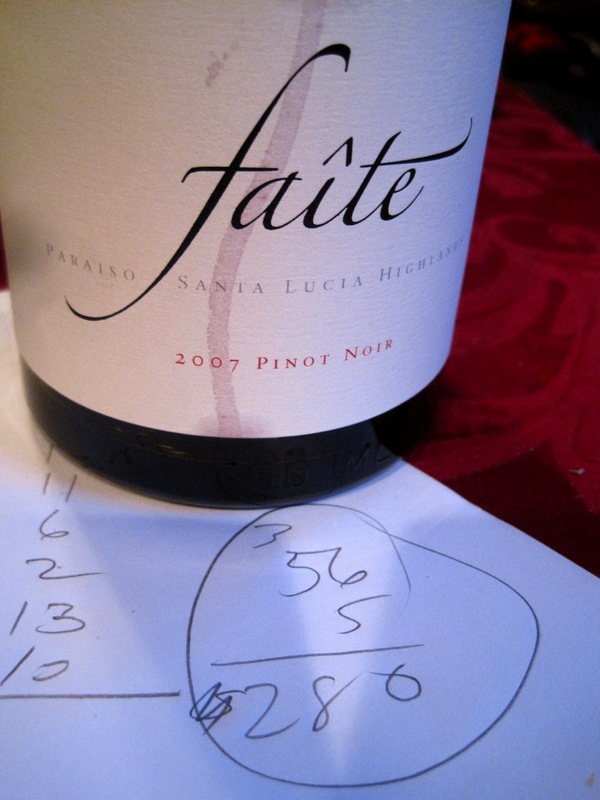 When Jake and I were tasting wine at Paraiso Vineyard, Dave Fleming, one of the winemakers, gave us a good exercise for determining how much you should pay for a bottle of wine. He told us: think of all the words you can to describe the wine, then multiply that number of words times five dollars per word. 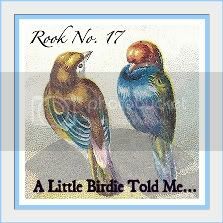 I joked that that meant if I have a bigger vocabulary than another person I would have to pay more for the same bottle of wine! I thought that would make some fun mandatory fun for Jenn's birthday dinner when I was uncorking that lovely bottle of Paraiso's 2007 Faîte Pinot Noir. Having paid $70, I tasked everyone with coming up with 14 words. Then we crossed off any repeated words and came up with - drumroll please! - 56 distinct description of the wine. So, 56 x $5 = $280...we got a steal of deal...and a great bottle of wine. I infused two jars of simple syrup with beets, one golden and one red, that will be used for cocktails. It's not a dinner party at Cam's unless there are some funky drinks being poured. 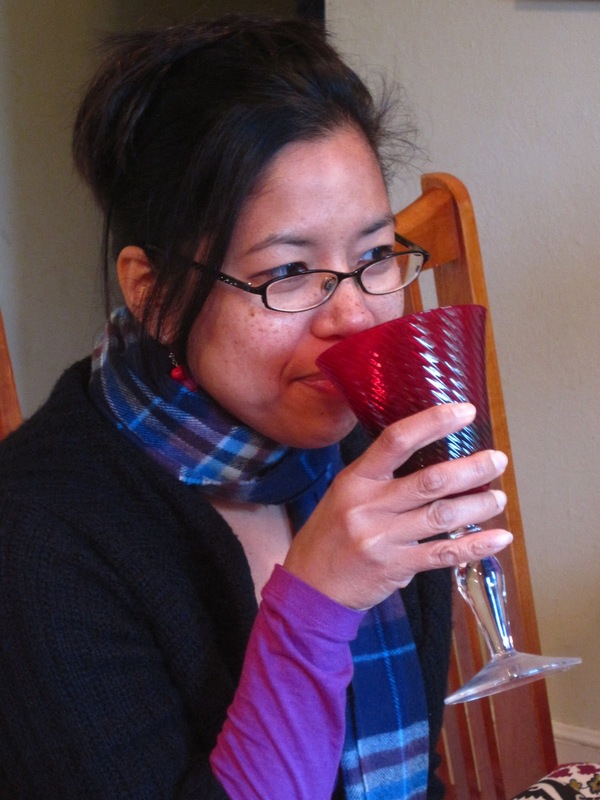 I'll post the recipes for a Beet-Nyk Martini and Beet Bubbly tomorrow night. But for now, here's how I made the syrups. Boil one beet in each color - one red and one yellow. Then skin and slice the beets. 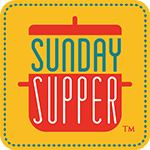 Create a simple syrup with 1 C organic granulated sugar and 1 C water. Cook that over medium heat until the sugar is dissolved and the syrup begins to thicken. Pour half of the syrup in one jar and half in the other; add a squeeze of lemon juice into each jar, then drop the sliced beets into the syrup. 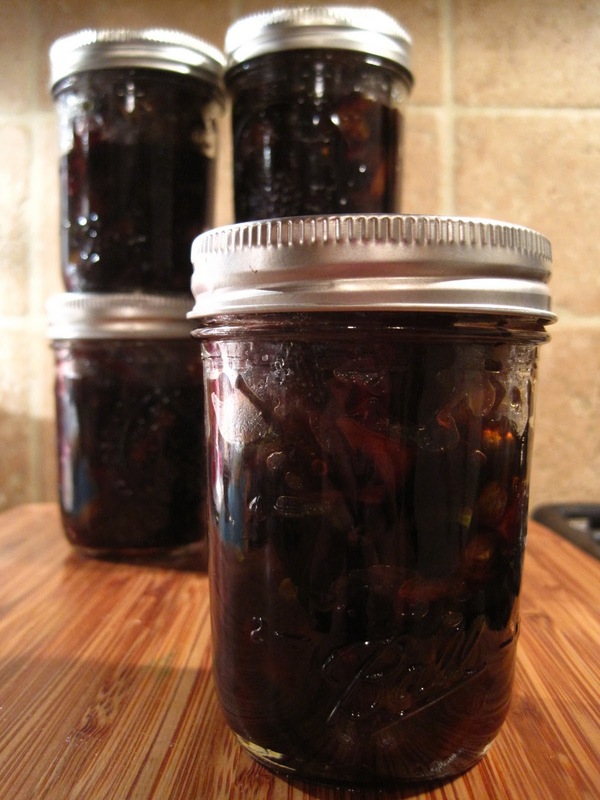 Infuse for a minimum of 2 hours and a maximum of five days. 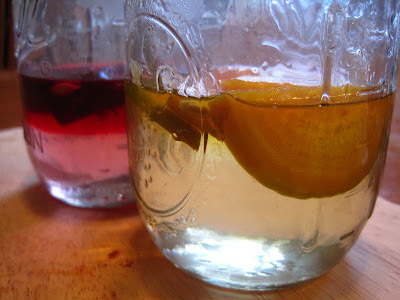 After seeing the candied orange peel on Jake's affogato at Ici in Berkeley, I decided that I would infuse lemon peels with beet juice and, hopefully, created a pink candied peel naturally, without food coloring. The lemon peels were looking very pink through the first two blanchings, but by the time they were completely candied, they just looked like orange peels. Oh, well. They taste delectable even if they aren't the color I intended. Take the peel of your citrus and slice into thin pieces. Place them in a pot, covered with cold water, bring them to a boil. 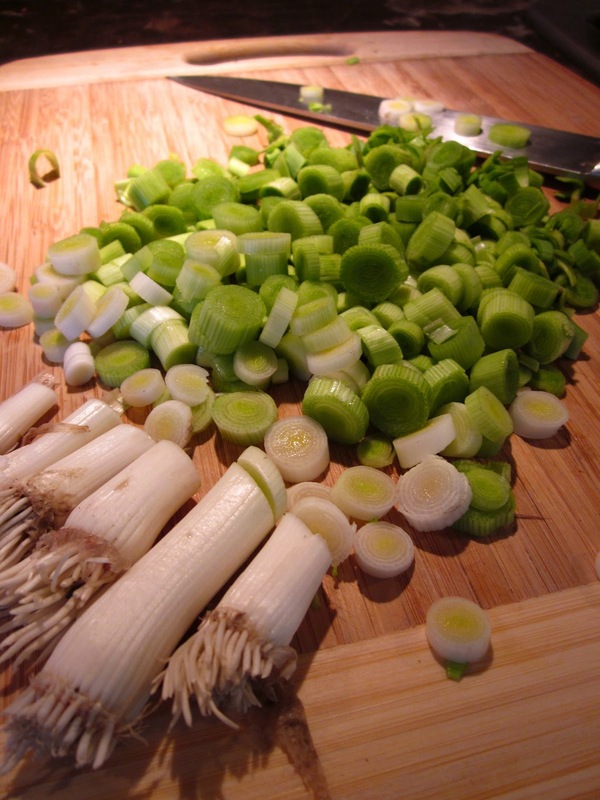 As soon as they boil, remove from heat and drain. Repeat two more times. These will be finely chopped and sprinkled on my version of affogato tomorrow night. 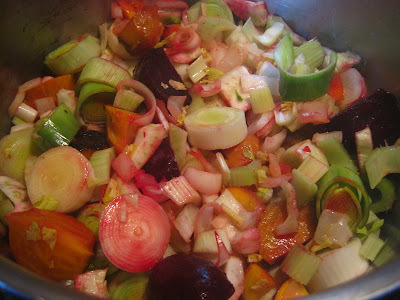 This began with Michelle Miller's Spiced Apple Chutney but evolved to include beets as well as some other variations. In a large saucepan, I crushed 8 tepin chilis - this chutney has a lot of heat, so adapt as needed - and heated them with olive oil. Then I added all of the chopped ingredients, a jar of green peppercorns, 3 C raw sugar, 1 C apple cider vinegar, 2 C white balsamic vinear, 3 T pomegranate vinegar, 1 T ground ginger, 1 T ground cumin, and a pinch of saffron threads. Bring to a boil, stirring frequently. Reduce to a simmer, stirring about 1 hour until thick. Place in hot water bath for 10 minutes. Serve with a lamb roast. 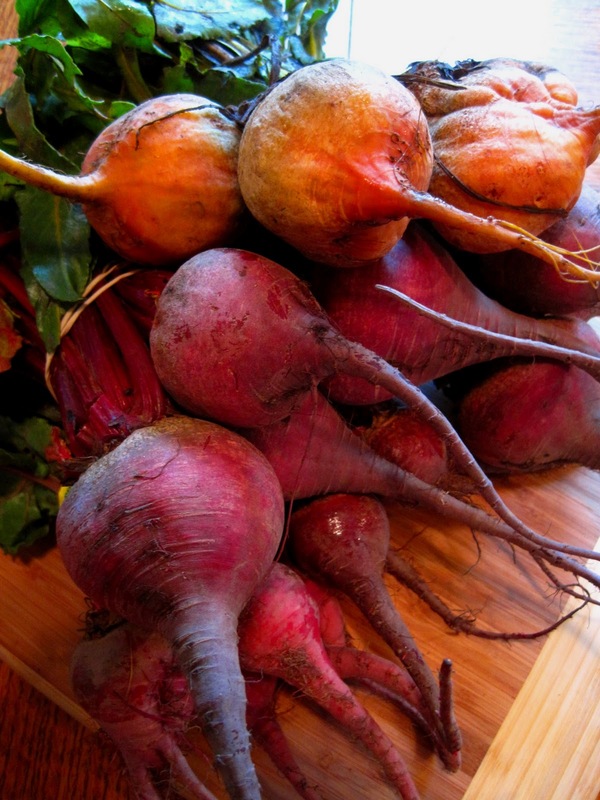 Last time I served beets to a good friend, he asked, "Are you mad at me? Why are you feeding me purple dirt circles?!?" And since one of my missions in life is to expand people's palates, especially in regards to fresh fruits and vegetables, I figured that I would build an entire menu around those purple dirt circles and prove to him how tasty they really are. First thing he'll note is that all beets aren't purple. I hit the farmers' market and bought lots and lots of beets. Red beets, golden beets and - my visual favorite - chioggia beets which are striped red and white like peppermint candies. After my Ode to an Aubergine dinner, he liked eggplant; we'll see what he says about purple dirt circles tomorrow night. I cleaned and roasted a dozen beets tonight as the basis of several recipes. I scrubbed and trimmed the beets, then rolled them in olive oil and sprinkled them with pink Himalaya salt. Then I roasted them in a 350 degree oven till they were fork-tender. It took about an hour. Now I'm ready to get cooking! 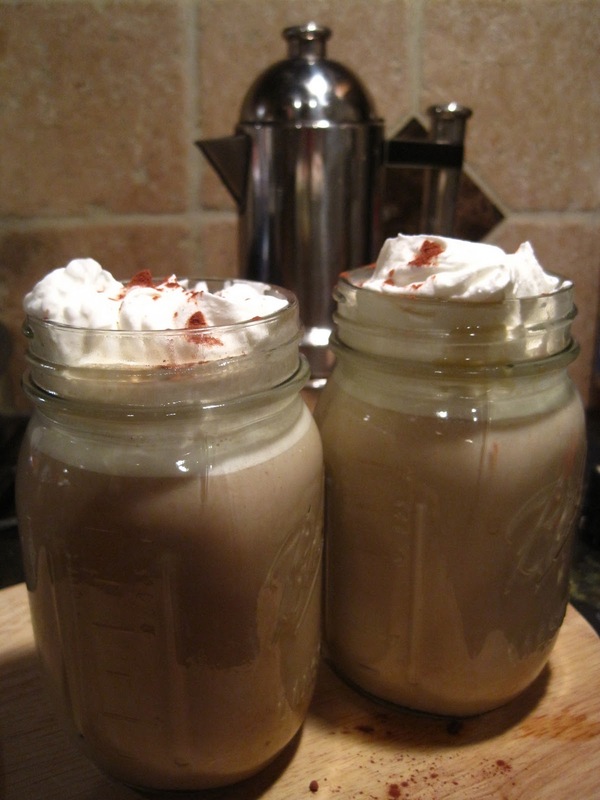 Caife Gaelach, Irish Coffee, is usually made with Irish whiskey. But having used all of the whiskey in the house on my Irish Carbomb Cupcakes last night, I opted for Bailey's.